IfI’ve posted this before, please forgive me. I need to go back through my blog and write down the recipes I’ve been sharing so I don’t end up repeating a recipe you’ve already seen! There’s nothing better on a cold winter’s day than beans. Boston baked beans, New England baked beans, Hambeens (so good! ), chili-they all hit the spot and add fiber to my diet, which I’m told I need more of. I like this chili recipe because it isn’t so spicy that I can’t eat it. I don’t like things too spicy. This recipe fits my 1970s K-Mart Crockery Kettle perfectly. 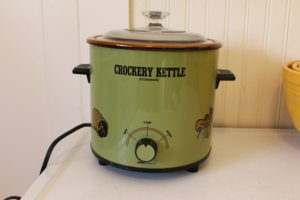 My mom gave me this slow cooker years ago, when I moved into my first apartment. It does not have a removable insert, so I have to be careful when I wash it. It still works like a charm! This recipe comes from the Fix It and Forget It Cookbook. If you ever come across a copy, grab it! Brown beef, drain and remove from skillet. Using the same skillet, saute the onions, pepper and garlic for about 5 minutes. Add beef and vegetables to the Crock Pot, along with the other ingredients. Stir, cover and set on low 5-6 hours. You can serve this in a bread bowl if you wish. Cornbread with honey butter always goes great with chili! My 1970s K-mart Crockery Kettle slowly cooking Chili Con Carne on a cold, grey winter’s day.